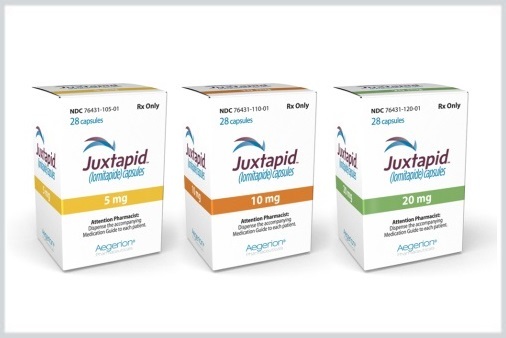 Aegerion announced the launched of three new dosage strengths for Juxtapid (lomitapide mesylate): 30mg, 40mg and 60mg strength capsules. Juxtapid is approved as an adjunct to a low-fat diet and other lipid-lowering treatments, including LDL apheresis where available, to reduce low-density lipoprotein cholesterol (LDL-C), total cholesterol, apolipoprotein B and non- high-density-lipoprotein cholesterol in patients with homozygous familial hypercholesterolemia (HoFH). It is a MTP-inhibitor that reduces blood cholesterol and triglyceride levels by limiting the production of lipoproteins from the intestine and liver. Juxtapid capsules are now available in 5mg, 10mg, 20mg, 30mg, 40mg and 60mg strengths in 28-count bottles. For more information call (855) 305-2347 or visit Juxtapid.com.